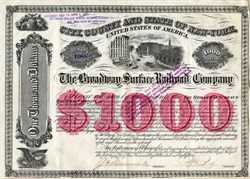 Beautiful certificate from the Broadway Surface Railroad Company issued in 1884. This historic document was printed by the Arthur-Brown Company and has an ornate border around it with a vignette of old New York. This item has the original signatures of the Company’s President, James A. Richmond and Treasurer, and is over 129 years old. On May 8, 1884, Jacob Sharp, the owner of the Broadway and Seventh Avenue Railroad, incorporated the Broadway Surface Railroad to run along Broadway from Union Square south to the Bowling Green. It opened in 1885, and was leased to the Broadway and Seventh Avenue Railroad. A cable was installed on May 1, 1893, and the Lexington Avenue Line and Broadway and Columbus Avenue Line were also operated by cable as branches. The Broadway Line was electrified with conduit in May 1901. The Broadway and Seventh Avenue Railroad was leased by the Houston, West Street and Pavonia Ferry Railroad on June 30, 1893, and the lessee merged with the Broadway Surface Railroad and South Ferry Railroad on November 29, 1893 to form the Metropolitan Street Railway. Buses were substituted for streetcars by the New York City Omnibus Corporation on March 6, 1936. That company changed its name to Fifth Avenue Coach Lines in 1956; the Manhattan and Bronx Surface Transit Operating Authority took over operations in 1962. When Broadway, Sixth Avenue, and Seventh Avenue became one-way streets, the Sixth Avenue bus (numbered 5) and Broadway-Seventh Avenue bus (numbered 6) were combined as the 6, now the M6. Closures of Broadway in the Theatre District south of 47 Street and around Herald Square in 2009 resulted in major changes to southbound service, with the northern half of the route shifting to 7 Avenue before returning to Broadway in the vicinity of Union Square. In June 2010, due to budget problems, the M6 was discontinued and the M5 was extended to South Ferry via Broadway.